“Ray,” I began, “why is there so much violence among street people?” Gibson is, himself, a street person. No one has seen more Southside slugfests, knife fights, chain-whippings, and brouhahas than Gibson. He’s becoming Southside’s Forest Gump of rumbles. “I suppose [the violence]…is just from basic instincts that come from the stress of living on the streets [of Berkeley],” Gibson speculated. “I can relate to that,[becoming violent]” I told Gibson; and then I related my experiences as a homeless lunatic back in the day. I had become a violent animal from sleeping in Berkeley’s hospitable Northside oasis, Live Oak Park. My name means man of peace. I had never struck another being, and had briefly been a divinity student, but I was growing hostile from a two-year struggle to stay housed. Life at Live Oak Park was already strained; and that was before Ken moved in. There were two of us — before Ken — sleeping on a weathered wooden deck out back of an arts center in the park. The wooden deck, our pallet, was protected by an overhang. I had expected to be the sole guest of this resort hobo hotel (wooded, with a gurgling stream), frequented by friendly raccoons. But Benjamin, a Northside character had beaten me by months, maybe years—on the boards. His legs banged, all night, like mallets—from alcohol tremors. Sometimes I was driven out into the neighborhood looking for sleep, but only wound up exposed and feeling unsafe. Then Ken moved in. We hadn’t advertised for a roomie, but then we didn’t have a lease, either. At first, we assimilated Ken into our routines. We assembled, like privates at bootcamp, before breaking camp after an inspection in which we checked each other for clinging leaves, straw, and other signs of homelessness. To this day, I’m not sure how we worked ourselves into a rage over Ken’s intrusion. All I know, is that we descended on his gear after he broke camp one morning, and tore, and scattered it, rendering it useless. We shoveled the shreds of his estate into a stone camping stove. A few days later, I moved out, telling my leg-thumping pal that I couldn’t go on living this way. I conned my way into a tiny but cheap office, where I slept on the floor and struggled to ignore noise in the hallway outside my office. The fissure in a popular People’s Park tree somehow reminded me of those lunatic years when I acted out of instinctive violence, as Gibson had said. 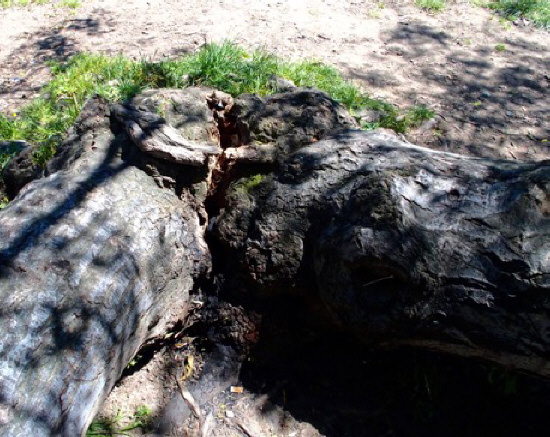 The spontaneous fissure of the tree in Peoples Park could be a reminder of the violence of homelessness. This entry was posted on Saturday, May 14th, 2016 at 6:17 pm	and is filed under The Global Scene Through Berkeleyan Eyes. You can follow any responses to this entry through the RSS 2.0 feed. Responses are currently closed, but you can trackback from your own site.